Sam Taylor-Wood's hotly-anticipated film Nowhere Boy traces the teenage years of John Lennon as he progressed from the Quarrymen to The Beatles, from Liverpool to the dark clubs of Hamburg and beyond, and the influence of his mother Julia and aunt Mimi upon his life. Integral to the tale is the early rock 'n' roll music that enthralled a generation of teenagers – not least of all Lennon, his schoolfriends and Liverpool contemporaries who would, in time, help change the world. 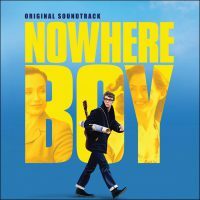 Nowhere Boy's two-CD soundtrack album contains a mixture of classics that inspired the pre-Beatles Lennon, along with a handful of his original compositions. There are also several new recordings by the actors who play the Quarrymen in the movie, here credited as The Nowhere Boys. The sense of excitement and newness that rock 'n' roll instilled in teenagers in 1956 is established early on. Dickie Valentine's easy listening Mr Sandman harks back to the innocent days of the BBC Light Programme, music hall and variety entertainment, before Rocket 88, Hound Dog and other musical milestones kicked the doors wide open for a generation of enthralled teenagers. The six Nowhere Boys songs, and a solo recording by Aaron Johnson, who plays Lennon in the film, are mostly monophonic, rough and ready throwbacks to the skiffle era. Among them is Maggie May, the traditional Liverpool song which the 16-year-old Lennon sang on the day he first met Paul McCartney, and which The Beatles recorded 12 years later for Let It Be. Eddie Cochran's Twenty Flight Rock, famously the song McCartney played to impress Lennon on their first meeting, is included. Another key song in Beatles lore, Raunchy – which George Harrison was persuaded to play to prove his worth in the group – is also here, in a new recording by The Nowhere Boys. I remember some Thirties or Forties song which was [singing] 'You're delightful, you're delicious and da da da. Isn't it a pity that you are such a scatterbrain.' [Laughing] That always fascinated me for some reason or another. It's also connected to my mother. It's all very Freudian. She used to sing that one. So I made Hello Little Girl out of it. The first CD ends with John Lennon's 1970 song Mother. In contrast to the stark Plastic Ono Band version, this is a lesser-heard session version with Lennon on guitar, previously released on the Lennon Anthology box set. The song had never before been licensed for cinematic use; Taylor-Wood successfully persuaded Yoko Ono that its message was important for Nowhere Boy. On the soundtrack, however, it sits slightly uneasily amid the 1950s skiffle and rockers. The second CD contains songs that proved an inspiration to Lennon, although none were used in the film. Some, however, were covered by The Beatles, among them Twist And Shout, Money (That's What I Want) and Long Tall Sally. A line from Elvis Presley's Baby Let's Play House became the inspiration for Rubber Soul's Run For Your Life; The Del Vikings' Come Go With Me, meanwhile, was the song Lennon was singing at the Woolton fête when Paul McCartney first set eyes on him on that fateful day in July 1957. Taken separately from the film, the Nowhere Boy album is at the very least a great collection of early rock 'n' roll songs. The second half alone would make a fine introduction for anyone curious about the sounds that lit up the airwaves in the late 1950s. When linked to the life story of a figure as beguiling as John Lennon, however, it helps illuminate a part of The Beatles' early history which has rarely been brought to life. Hi, I’m Krista. I’m 14 and I am the owner of one of the biggest Thomas Sangster website. I’m a huge Beatles fan and an even bigger Thomas Sangster fan (as you my know, he plays Paul McCartney in Nowhere Boy). The album sounds great but, I don’t know about the cast of Nowhere Boy (or as the CD puts it ‘The Nowhere Boys’) singing some of The Beatles songs. Not to be harsh but, it might just ruin these songs. I mean, they are NOT The Beatles. But, I could be suprized :). But, something that makes me a little dissapointed is that there is ‘Hello Little Girl’ which is the song John Lennon wrote about his mother and on the CD Aaron Johnson sings, but theres not ‘I Lost My Little Girl’ which is the song Paul McCartney wrote about his mother and her death from breast cancer. I have read the script and ‘I Lost My Little Girl’ is in the movie. Paul sings it to Julia. I was really looking forward to this song on the CD and it really upsets me that it’s not on here :(. Being a huge music collector, one of my major pet peeves is inaccuracies in music biopics, especially in the music itself. There’s 3 songs (or versions of songs) that really don’t belong. Jerry Lee Lewis cut “Wild One (Real Wild Child)” for Sun in ’58, but it wasn’t released until decades later, after John had passed away. “She Loved Everyone But Me” & “I Fought The Law” are both recordings made many years after the time frame if this movie. In the case of the latter song, the original ’59 version by The Crickets should’ve been used instead. Don’t care much for revisionist history. Tell the story accurately or don’t tell it at all. In fact, the only music biopic that I can think of that is wholly accurate is “Ray”.